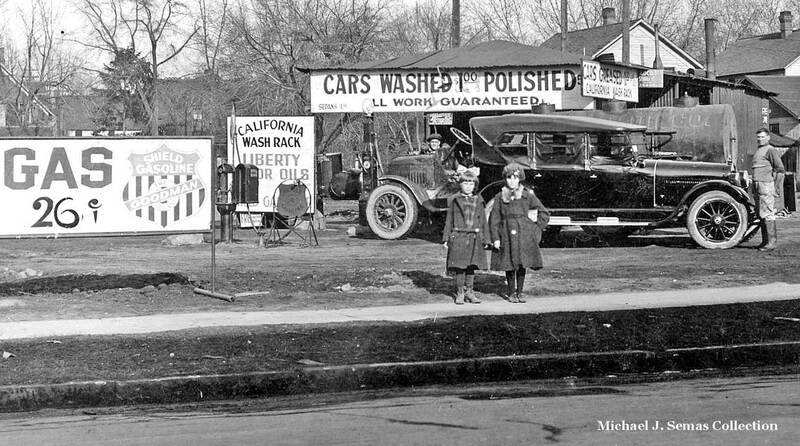 The Michael J. Semas Collection consists of unique images of the California Central Valley along with some taken out of the region and in other parts of the country. Most all of his postcards are unique and tell a visual story. This set starts out with a lead image of a boiler tender at some sort of a mill or business relaxing in his shop-made rocking chair. The chair is built of dimensional lumber, padding, and possibly burlap bags that are held on with strips of metal and nails. 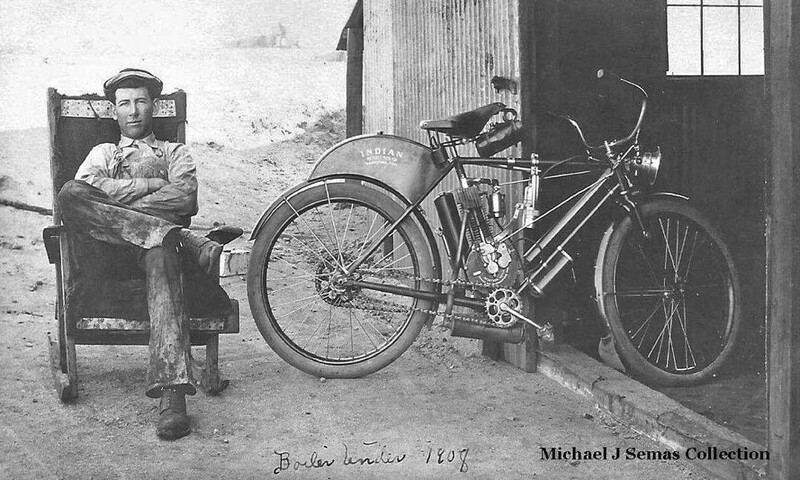 To the right is his pride and joy, a circa 1907 “Camelback” Indian single-cylinder machine. One would think he built the chair to rest on outside while escaping the heat of the boiler room. Here we have what looks like a circa-192o low-budget filling station that washed, polished and greased cars. The 26-cent a gallon gas that although it seems cheap today, was expensive at the time. The Patterson Irrigated Farms either had a lot of money behind it or it was a big success. The chauffeur-driven car, a circa 1910 Peerless was one of the best and most expensive domestic cars on the market at the time. 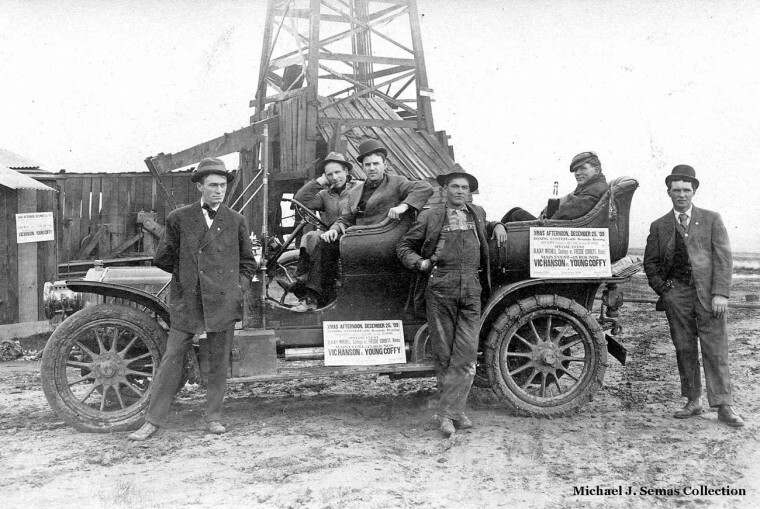 This circa 1905 Thomas-Flyer appears to have been used by the promoters of a Christmas afternoon fight in the California oil fields. I looks like the gent in the back seat started the party early. The proprietor of this “streetcar” below was a colorful character named Martin Itjen that first started out with a Veerac light delivery truck, and next used a converted Model 30 Packard with a stuffed bear mascot. 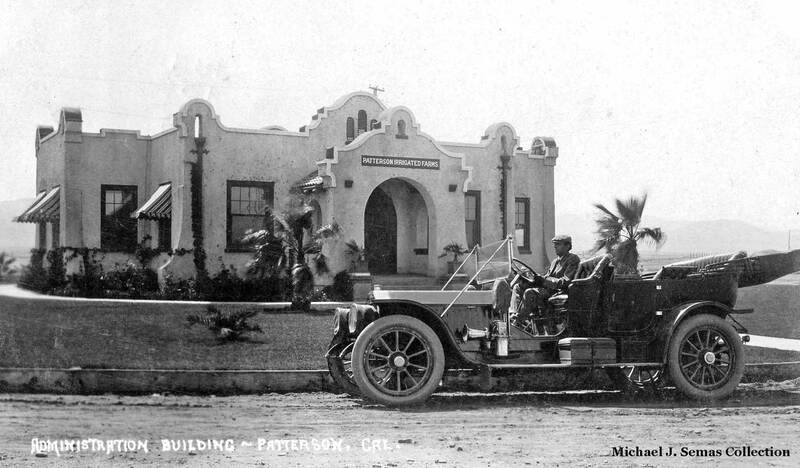 He became a Skaguay Ford dealer and this, his third vehicle was constructed on an unknown truck chassis. This entry was posted in Auto photos 1885 - 1920, Motorcycle photos and tagged 1910 Peerless, Indian Camelback Motorcycle, Skagway Ford dealer, Thomas-Flyer. Even in 2016 the best way to learn about Skagway history is to take a motorcoach tour of the area. 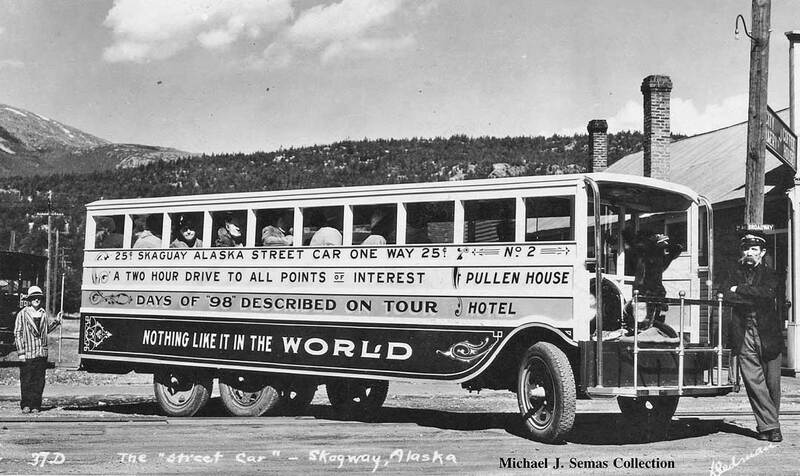 The last I had seen a few years ago appeared to be like the White Motorcoaches of the early 1900’s in Yellowstone, etc. The operators tell interesting tales of the miners and gold seekers of the 1800’s as they tour. One remarked that women chose a husband based on the size of his wood pile outside his home. These tours are not to be missed. According to Fred Dibnah, the old steam engine technicians used to sit around in decrepit easy chairs listening for irregularities in the engine. And to escape the heat in the hot Central Valley. Re the Skagway bus there was a short story on the subject on the Fountainhead Museum site a couple of years ago. Judging from the way the passengers looked like they are stuffed inside the bus, it must not have been very large or roomy! Early or “other mix “of AA Ford might have included the same Dual Worm Drive that was on the GAZ AAA (GOOGLE IT!) of Russia, (with anything paved there in Russia in the early 30’s being a rarity!! !, (perhaps? touring around Skaguay may have ALSO required Extra traction for the extended vehicle. Edwin W.